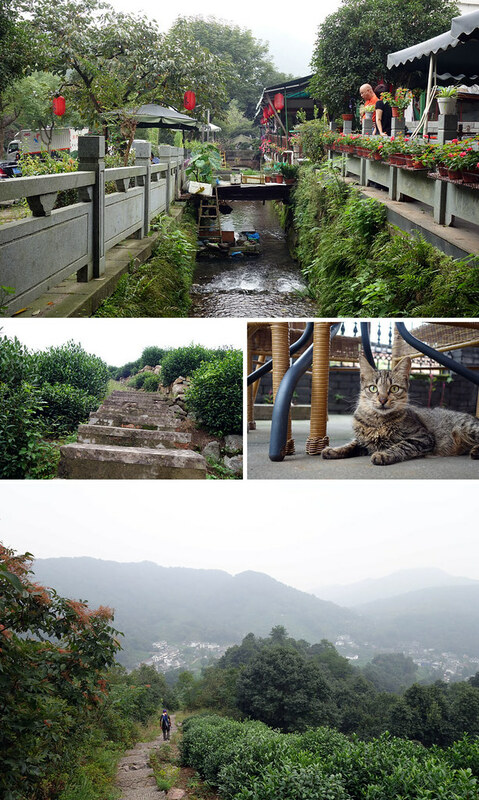 We had a long weekend thanks to the Mid Autumn Festival 中秋节 holiday, and I managed to visit both Longjing village 龙井村 and Daming mountain 大明山. I spent Saturday exploring my neighbourhood, and concluded that I should really kill my hopes and stop trying to seek out “fun” around here. There are nice running paths along rivers and manicured gardens, but that’s about it. Every mall is half-dead, and most restaurants in it don’t look appetizing. So I’ll stay in my own comfy apartment when I’m here, and make the hour-long journey into town both days of the weekend from now on. 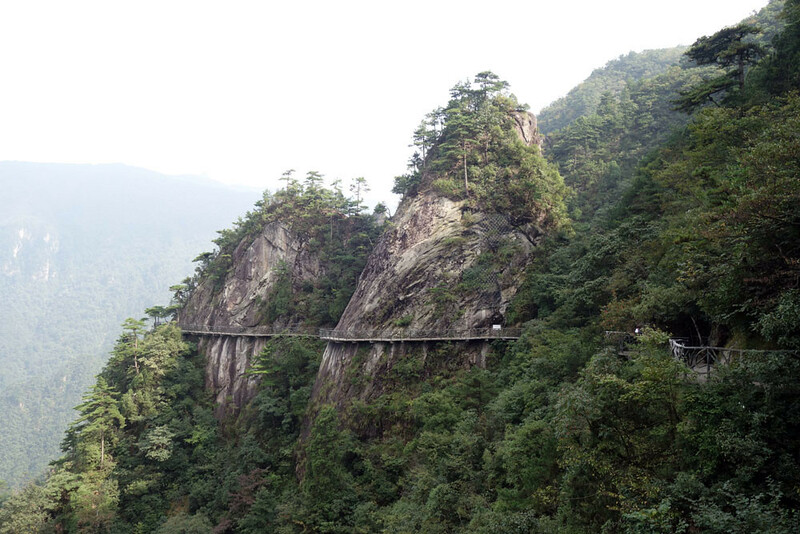 Longjing is a long way away, deep within the vast, lush area to the east of West Lake. I should’ve taken a cab there, but I’m cheap and decided to rough it out with the 2-hour, 3-bus journey. The last bus that went through the famous attractions was packed as hell. I don’t know why I do this to myself even though I can afford cabs. HAHA! Got off, followed the crowd, fended off old ladies touting their restaurant and teas, and wandered up a random trail through the tea plantations. While it was a foggy morning, the view up this short, easy trek was still pretty sweet. 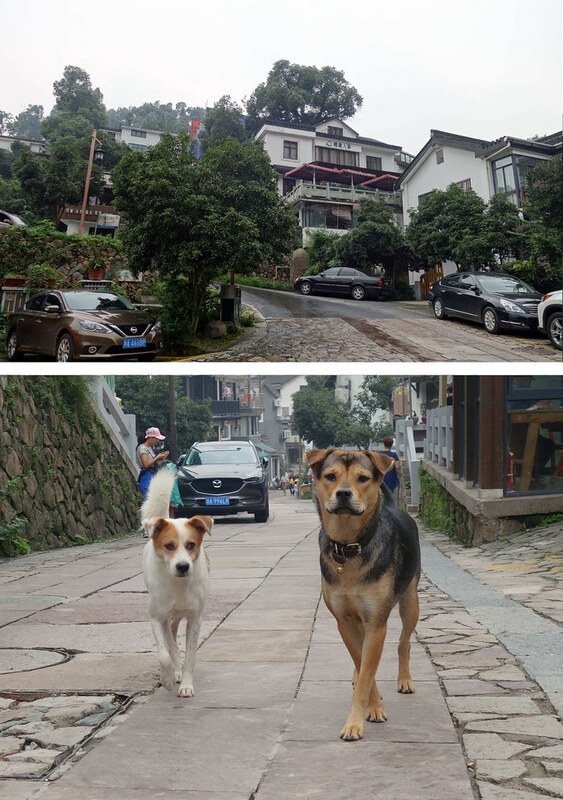 The main village, just like every attraction in Hangzhou, is very touristy. They were selling their famous Longjing teas for SGD10/glass. Ridiculous. So I fired up the 大众点评 app and found the 航茶坊 farmer’s restaurant. It was further away from the tourist traps and had great reviews, so I gave it a shot. 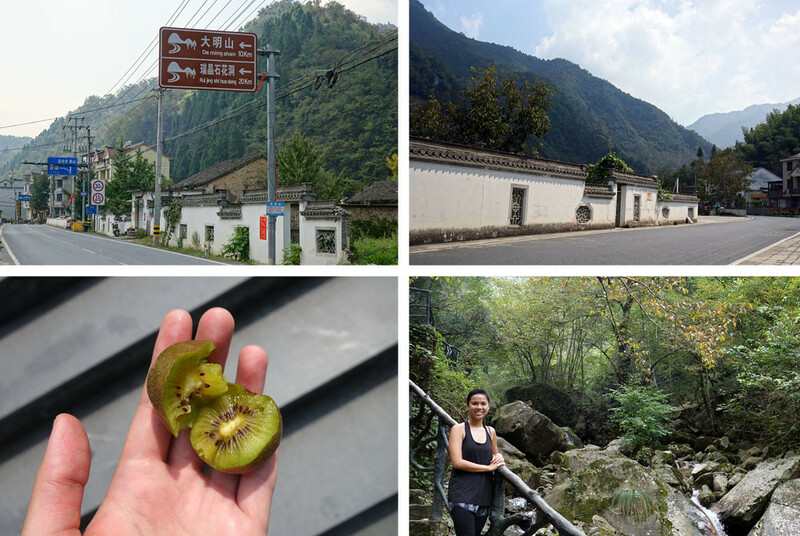 Hopped on another bus that climbed the narrow, winding roads into a slopey village. 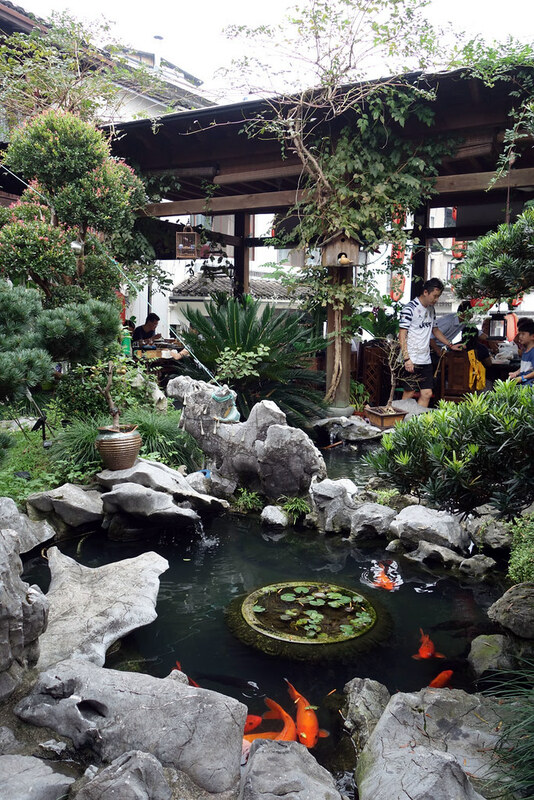 I totally enjoyed my meal at the beautiful 航茶坊 – just look at its Koi garden! Gorgeous… Had a cup of their top grade 特级 Longjing tea for SGD6. The first glass was potent and more bitter than I prefer, but the subsequent refills made it weaker, and much more palatable. I think the small bunch of leaves lasted me about 4-5 glasses. It washed down my lunch of steamed fish and rice perfectly. 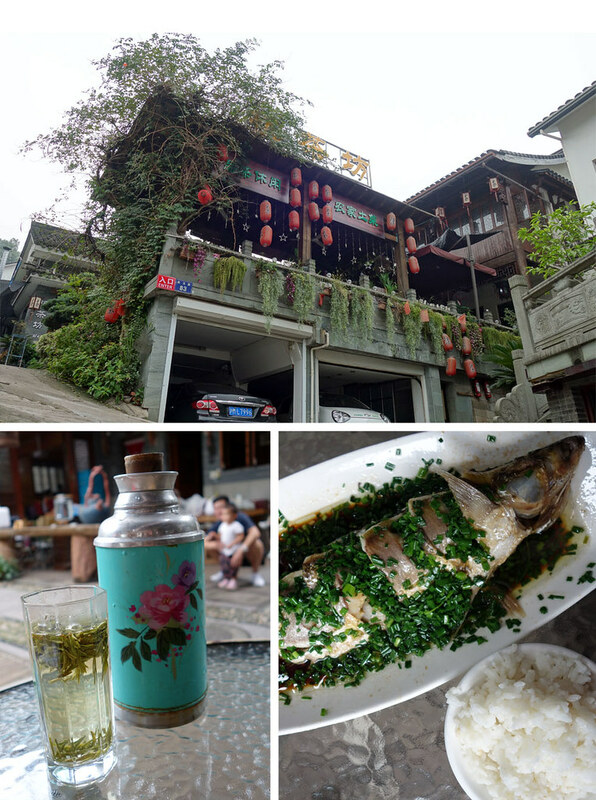 While the fish was said to be tea-infused, the dominant fragrances came from its sesame oil, soy sauce, and spring onions. It was a classic steam fish dish made much more memorable because the fish was really fresh so its flesh was divinely smooth. Great weather was predicted for Monday, and I planned to do a another hike. 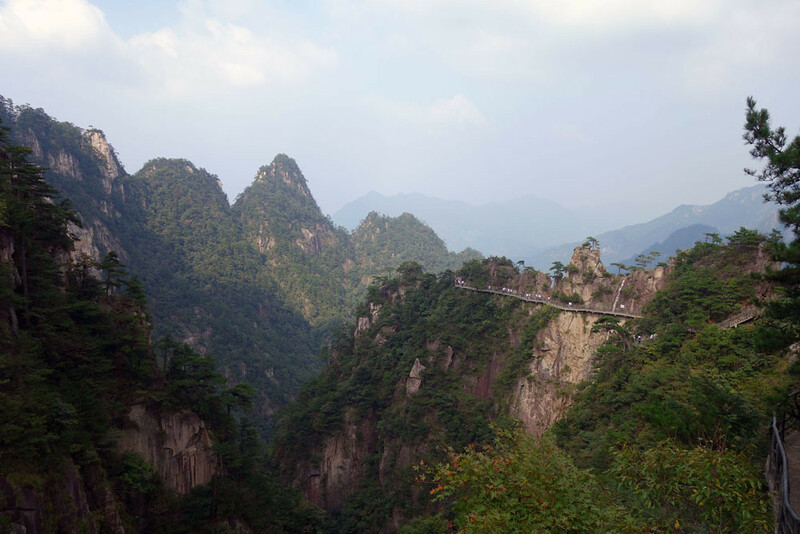 But Wilson, a fellow Alibaba employee and friendly Malaysian, texted and asked me what I thought about heading further out to Daming mountain 大明山. 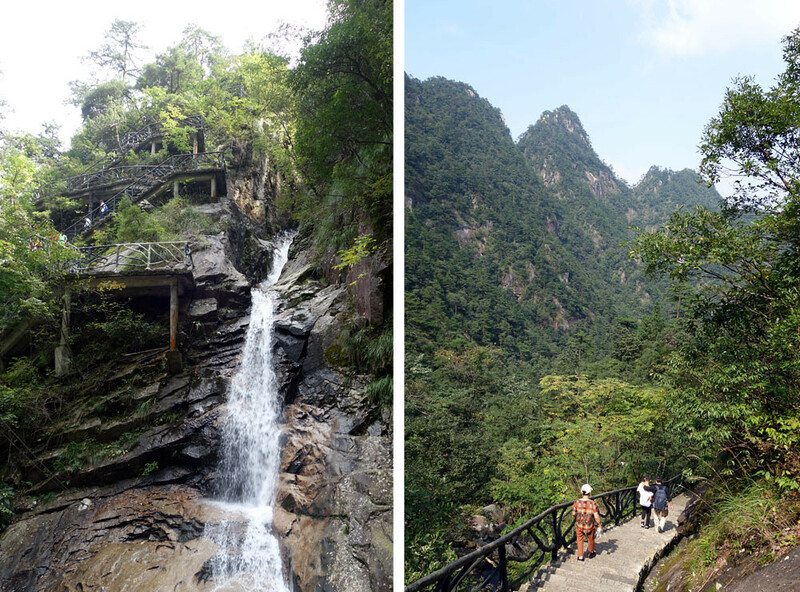 After some impromptu arrangements, we ended up in Liu Hwa’s (his Chinese colleague) car, and within 1.5 hours, we were at the foot of this lesser-known attraction. It was stairs all the way up for about 40-50 minutes. We took our time because the views kept stopping us in our tracks. 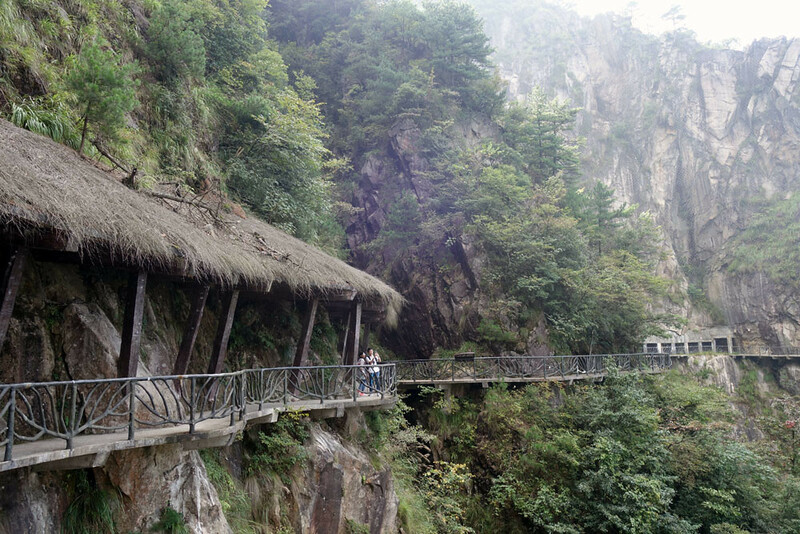 The highlight of this attraction is this walkway built into the side of the cliff. Maximum views, minimum effort! We decided to descend the mountain via this fun-looking slide. It could’ve been a lot more fun if we didn’t have to stop multiple times to wait for people in front of us who kept getting stuck. Because you had to control your speed by gripping the handrails and pushing your feet outwards, we had to put on ridiculous pieces of clothing for protection. What a great look.